Dong Architectures – Guizhou C.I.T.S. Drum-tower and Roofed Bridge in Dong village are two kinds of ancient buildings in China which were the cream of architecture art and the gem of national culture, which made a great contribution to the architectural art and occupied an important place both in architecture and ethnology. Drum-tower and Roofed Bridge in Dong village are the characteristic public buildings in the area of Dong Nationality, which have a long history, beautiful shape and unique structure and many uses where the Dong people could hold meetings, sacrifice, rite, even entertainment or have a rest. It is a typical scene of Dong village that Drum-tower towering in the villages, roofed bridges crossing the suspension houses closing together in a row rivers and. Their Roofed Bridges, crossing over the flowing water, are built by means of putting the bridge, corridor and pavilion together. They are practical, pretty and convenient. 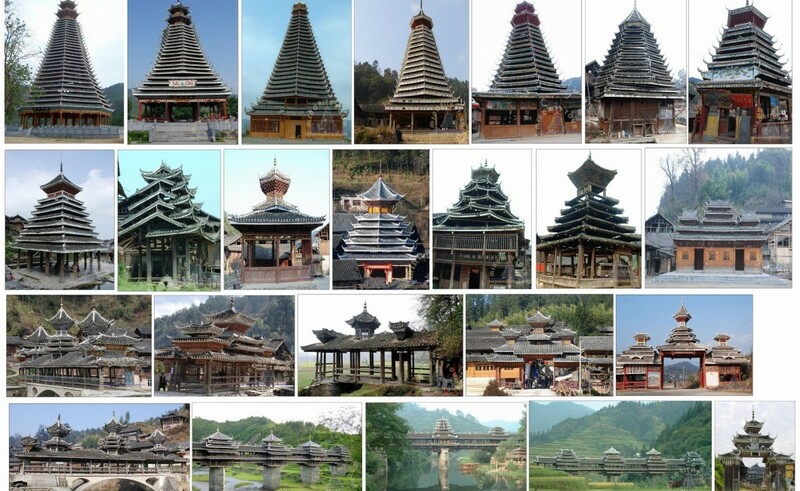 Most Dong Drum Towers are built in the form of a many storied pagoda supported by pillars of fir. They very from 3 to 13 tiers and reach a maximum height of 36meters.The eaves of the ground floor are four corned, while those of the upper levels are hexagonal or octagonal. The front between the first and second tire is carved with dragon and phoenix patterns-symbols of village prosperity. The Drum Towers of the Dong Nationality, looking very like pyramids, are made of fine wood. With unique technology the Drum Towers are constructed without any nails or rivets. Historically, Dong-inhabited areas were rich with Chinese fir trees. The local people respected fir trees. Drum tower, a landmark of Dong villages, are built in the shape of a fir. In general, the drum towers are square in shape .Some are square in shape on the first floor and second floor, while octagonal from the third to the top floor. The shortest ones have three stories while the tallest, 29 stories in Congjiang county. Odd numbered stories have dangling eaves. The flying eaves of all the stories are supported with golden claw pillars. At the canopy of the tower, there is a mast that is hung with a treasured bottle gourd. © Copyright 2019, Guizhou C.I.T.S. All rights reserved. No.53 East Yingpan Road, Kaili, Guizhou. China.